What is the price of opal? This report sets out to explain the factors that would influence just how much you should pay for an opal gemstone. We are focused more on the end buyer rather than on wholesale price logistics. As an example, you wish to buy an opal ring or any other jewel featuring opal - what would a reasonable price for the jewel be. We are keeping the information as comprehensive as possible without, getting too technical and confusing. The information is provided by the experts at Kaisilver, the leading online custom made jewelry provider from Thailand. The entire discussion related to the price of opal will presume that, we are referring to a natural opal and not a factory made substitute. There are a few varieties of opal, the yardstick for quality generally differs between them. The most popular characteristic that opal buyers expect to find in their gemstone is the 'color play' effect. This refers to the flashes of color that you see in an opal when light strikes the stone. 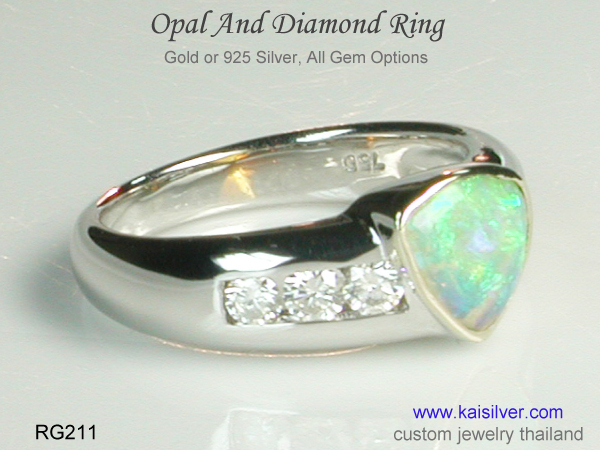 The RG211 custom opal ring from Kaisilver shows a white opal gem from Australia, the colorful flashes are clearly visible in the images. Black opal is another interesting variety of opal, the finest natural black opal gems come from Australia. The Lightning Ridge Area of Australia is known for its world famous black opals. 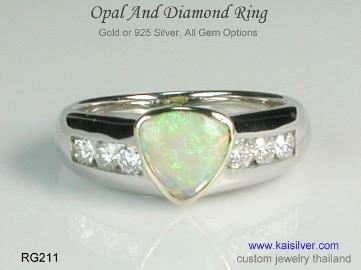 An opal is defined as black when, the it has a dark base color and displays the color flashes. The background color for a black opal could be dark brown, dark gray and is very rarely pitch black in color. Australian black opals are extremely rare and very expensive. You might come across black opals from Ethiopia, they are much more affordable but for most gem connoisseurs - Australia is the only acceptable choice. Gemstone dealers have learnt to treat Ethiopian opals to give them a dark background, the result can often be very impressive. Any treatment done on opals should be clearly disclosed, treated black Ehtiopian opals are very affordable. One of the main factors in determining the price of black opals is the origin, the treatment (if any) will also be worked into the price point. Black opals are expected to show color play on a dark background. The higher the color contrast between the color flashes and the base color, the higher the price of the gemstone. So what if an opal does not show the color play phenomenon, will it always be very cheap. To put it simply, opal varieties which are supposed to show the color flashes will be valued lower if, they do not show the effect. However there are some varieties of opal gems where, the price determination does not presume the existence of the color play phenomenon. A good example is fire opal, a gemstone that get's its name because of its flame like color. These gems range in color from yellow to a deep reddish orange, bright orange is probably the most favored. Interestingly, men look for deeper reddish orange fire opal gems for their rings. The price of fire opal does not drop because of the lack of the color play effect. The cost of fire opal is based on a different set of features. Fire opals that have a good transparency, almost no visible inclusions or cracks and tend to be in the orange color range, are priced higher. Origin is once again very important and Mexico is home to the most sought after fire opal gems. Brazil has more recently started outputting fire opal gems from its mines but, these are priced much more favorably than fire opals from Mexico. We should mention one more type of opal that does not display the color play phenomenon, this is the pastel pink opal from Peru. There is a range of prices applicable for pink opal, the color is one important consideration. This stone can often show dark spots which could be due to some other material being embedded during formation. When paying for a pink opal stone, you would look for a nice smooth cut, uniform color spread and the absence of any flaws or blemishes on the surface of the stone. Transparency does not feature into the price determination of pink opal because, the gem is always opaque. Pink opal will surely not have the color play effect seen in white or black opal gemstones. You now know the basic parameters that will determine the price point of various opals. There is one more price logistic that needs to be explained, we will do it right here. If you had two pieces of opal, one small and the other a few times larger than that and the quality of the two stones was very similar - the price per carat of the larger opal gem would be higher. This price behavior is true of almost all gemstones, keep this in mind when choosing a design for your opal ring. We talked about the pricing of opals but, when picking a jewel featuring the gemstone many more factors would influence the price point. Taking the RG211 opal diamond ring as an example, the jewel is invested with fine workmanship, a certified custom cut opal from Australia and a good metal weight. It is possible to get two near identical opal rings from two different jewelers, with VERY different characteristics. Two rings might look the same externally but, it takes some experience to observe that one of them would be just too flimsy and fall apart soon. When evaluating a valuable gem or a piece of jewelry, spend some time evaluating the jeweler before you begin considering the jewels. Kaisilver: The leading online custom made jewelry provider from Thailand. Kaisilver can craft just about any jewel for you ring old or 925 silver with the gemstone of your choice. You could pick a design from their website or send them your own designs and sketches. The support team at sales@kaisilver.com will be glad to answer any questions that you might have. You need not make any purchase to take advantage of their expertise, so do not hesitate to drop an email.